Weekly hobbit gathering at the Green Dragon inn in Bywater, running ever since May 2008. This is an event for and by hobbits, although a few visiting traveling dwarves are always welcome. It is also a 100% in-character event, so don’t go talking about things not belonging in Middle Earth! Come along for songs, dances, poetry, tales, riddles, news and much grand roleplaying! And do offer yer own entertainment, if yer like! Be in-character - be a hobbit! Keep player interactions (chats, emotes) and entertainment in-character, basically by talking about the things that hobbits in Middle-Earth would. Don't discuss real-life modern-day things, game mechanics, etc. Avoid using forced emotes, setting off fireworks inside, bringing pets that wouldn't belong in an inn, throwing 3000 snowballs, etc. Avoid multi-boxing with lots of alts. Yes, we know that you love to pull off that fat sound of a many-musician band. However, when the room is full of similarly-clad robots marching in line (if they move at all), who don't respond when you talk to them, things get rather creepy and the immersion we look for is often ruined. Entertainers are very welcome! Just sign up with the hobbit hosting the event, preferably by a /tell. Note that we absolutely love solo bards/performers - a lone lute-player is often better suited for the inn setting than a huge band. Also note that we absolutely love other kinds of entertainment than music: Poems, stories, riddles, the latest news from the Shire... lovely! If you want to play music, it is grand if yer aim for a folksy hobbity vibe, with reels, jigs, waltzes, hornpipes and the likes. Gossip and news is very welcome! This helps bring life to the event and the roleplaying in the Shire. Just remember to keep things in-character. Related to events: We generally don't advertise events held on other servers, events not of hobbit interest, events not held in the Shire or events not of a roleplaying character. Lastly, while the above may sound like a long list of rules, don't worry too much! Them hobbits are a friendly and tolerant lot, eager to welcome new visitors to the inn. See yer there! Contact Lina, Grand Order of the Lost Mathom. Last edited by Linawillow; Feb 03 2018 at 07:38 AM. But anyway, please do come and join us at GDF, it's a great place to meet new friends as well as catching up with old ones. Bringing a riddle is always a good idea, I hate riddles myself, can never figure them out. Hope to see some new faces on friday! It's a grand old night! 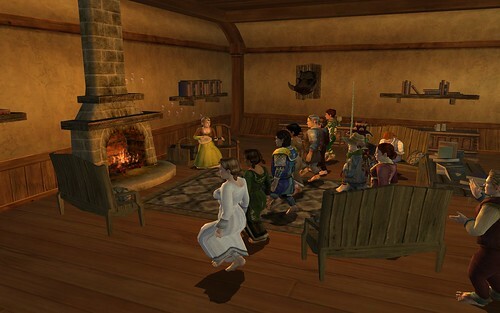 Plenty to join in with, even if it's just a spot of dancing and a dollop of Hobbity RP. Over the vast ocean blue! What to expect? Not a clue! It's not been long, not for me, nor for you! We'll soon return to Hobbiton-Bywater... Phew! I must confess, to my rhyming stupor! I'm no good, I know! I could be better! But bare with me now, for not much longer. Welcome old friends, to lands-over-yonder! Do not be afraid, lie still, see the wonder! We'll be back to our games! Here's to the next Green Dragon Friday! I've left a stub for you to edit. I would suggest creating a Green Dragon Friday lorebook entry for permanent storage of information. Thanks for the stub! I will likely update it, once me head has stopped spinning from trying to play with all the new toys over here. Edit: A first cut of our lorebook entry is now up! Last edited by Linawillow; Jun 01 2011 at 07:38 PM. I'll be sure an' stop by for a drink an' a tune or two!! This is a very charming event where you can let yourself go and have good old sing and dance. Highly recommended for your Hobbit! Lovely job on the page Lina, I'm quite looking forward to the next GDF and no doubt all the new faces. I'm sure Barmy won't mind all the extra customers. I only started RPing on my small alt's just before the servers went down. But I have three hobbit's with three different personalities who would like to drop by occasionally. I am a little slow at the rping but willing to learn. My hobbit's are, Rosebelle, Hollybelle and Lilyrosa. Hope to see you all in the Dragon tomorrow (if the servers are back up). Come once, come several times, come every time - no matter, as long as you are in the spirit of things, you will be welcome. And we try our best to be helpful to those new at roleplaying too! Should there be technical troubles, we will likely find our way to the Green Dragon on Landroval and enjoy a night at the inn there, at the usual GDF time. But here's hoping Laurelin will be up! We greatly enjoy our weekly gathering at the Green Dragon in Bywater. Recently we had a number of different events including concerts, a pie competition, an historical trip to Breeland, and even a Mystery Masquerade Ball under the stars on the last day before the server transfer. On Laurelin there are many talented poets, storytellers, dancers, and of course, musicians ...often you will find them at the Green Dragon performing and having fun. Excellent... the perfect end to the week and start to the weekend! Pop along and meet ya neighbours, in addition to the ale, the pies, the chat, the music and the dancing, there is a well stocked log fire... so a warm welcome is always guaranteed! Nice tradition, and I am happy you guys are keeping it alive. The weekend wouldn't be the same with out the Green Dragon to look forward to! I'll be there in one form or another! Well time for me to show up on a GDF now aswell. Back in the mists of time (ok, 2 years ago thereabouts) a small and shy Hobbit lass wandered into the Green Dragon Inn, Bywater looking for the place she'd heard about in tales. She happened to arrive on a Friday evening at a little after 8pm (As it was late spring it was BST -the equivalent of Daylight savings). What she found was the Green Dragon Friday (Or GDF as it is affectionately known) and thus started my first tentative steps in RP. I had originally joined the server as a "that'll do" decision and had no intent to get involved in that "daft RP stuff". The warm and friendly welcome I got at GDF meant I actually stayed until it ended..and came back the next week. I later joined a RP kinship (Grand Order of the Lost Mathom) and haven't looked back. I am still a regular at GDF and can often be seen bashing out a tune or two on my harp or lute, or shouting "Is it a duck?" in answer to all riddles. They said they'd be here! If you turn up at the right time and there's noone there, don't worry we haven't all run off and hidden behind the bar. The Layer system in Lotro can put you in a separate version of the same place. We are all in a different version of the Green Dragon. Just give us a /tell and we can get you into the right one. Mum always said it was rude to run indoors This was part of one of the first /tell I received. It was said in such friendly way I have always tried to remember it. To toggle between walk/run press INSERT on your keyboard. Don't mumble! Emote chat isn't often used on Laurelin, any chat put in Emote is likely to be missed with all the dancing etc. Please use /say as we wouldn't want you to think we were ignoring you. Buy the pretty lass in the red dress a drink Joking! This event is for fun, it's a way for friends old and new to get together and relax. Join in, dance a little, sing a song/recite a poem, tell a story or play a tune. The event can be quite hectic and we may not have time for your turn at the fireplace. Don't fear, there is alway next time...Or the time after. Thank you, come again! Unlike Apu from the Simpsons we aren't there to serve you, we are there to relax too. But the sun is shining! Please remember this event is based on European time, so when we refer to it "being late" and "Time for supper/bed" just go with the flow, it might be mid-afternoon where you are, but to us it's much later. It's friday and that means only one thing. It's Green Dragon, look forward to seeing everyone and any new hobbit's that decide to turn up to enjoy the music and all the other bits. Think I'll probably pop along to this.. I got Harperella 90% through the intro this morning, so I should be able to show up. However, I won't have time to roll a hobbit. I hope you won't mind me bumping my head on ceilings and pinching hobbit cheeks.